Print on Demand Copy, This guide presents the geological framework, depositional history, structural setting, geomorphology, and natural resources of this scenic, historically significant area. The guide to the route and stop descriptions include geological, historical, and cultural information about Cave-In-Rock, Tower Rock, the American Fluorite Museum, Illinois Iron Furnace, Battery Rock, and Annabel Lee Fluorspar Mine. Wayne T. Frankie and Russell J. Jacobson. The Ferne Clyffe State Park field trip area, located in the driftless portion of southern Illinois, embraces one of the most scenic and geologically complex areas of the state. Diverse topography, relief, structure, geological history, and distinct biota characterize the route. Stop descriptions include Round Bluff Nature Preserve, Hawks’ Cave, and a waterfall, all at Ferne Clyffe State Park; Southern Illinois Stone Company, Buncombe Quarry; Tunnel Hill; Bell Smith Springs; Millstone Bluff; and two alternate stops. Wayne T. Frankie. 2004. 51 pp. Guide to the geology of the Hamilton-Warsaw area, Hancock County, Illinois. Wayne T. Frankie and Russell J. Jacobson, 1998. David L. Reinertsen, Russell J. Jacobson, Myrna M. Killey, Wayne T. Frankie, Philip C. Reed, Terry F. Strauch, 1994. David L. Reinertsen, Russell J. Jacobson, Philip C. Reed, Robert A. Bauer, Bryan G. Huff, 1993. Discover the Hennepin Area, located the Illinois River in an area known as the Big Bend. This area has been uniquely affected by the history of Illinois glaciers: moraines, kames, kettles, askers, and several Illinois soils are abundant here. Find out about the ancient pathway of the Mississippi River and learn how the Illinois River developed. This field trip also helps you experience some of Illinois' unique history, including the Hennepin Canal Parkway State Park and sone of the earliest coal mines in Illinois. Wayne T. Frankie, Russele J. Jacobson, Ardith K. Hansel, Myrna M. Killey, Robert S. Nelson, Dave H. Malone, William E. Shields, and Robert G. Corbett. A guide to the geology of the Hillsdale area. 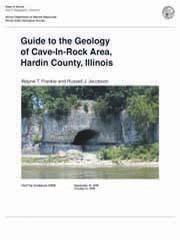 This guidebook highlights the geologic and natural resources of the extreme southern portion of Illinois. This area, known as Little Egypt, is one of the state’s most historic areas, both in geologic and human development. Stops include the Santa Fe Levee, which was breached during the Great Flood of 1993; Black Powder Hollow, south of Thebes, the location of a variety of agates; the faults and waterfalls at Rock Springs Hollow; and Horseshoe Lake, an oxbow lake. The guidebook also includes stops at novaculite and tripoli quarries. The discussion includes the geologic history of the Ohio River, an examination of faults and grabens, and an explanation of the rocks and minerals encountered along the route. Wayne T. Frankie, Joseph A. Devera, and Mary Seid.
. Pius Weibel and Robert S. Nelson, 2009.
. Leaders, D. L. Reinertsen, W. E. Cote, M. M. Killey, 1971.
. David L. Reinertsen, 1978.
. David L. Reinertsen, Dwain J. Berggren, and Myrna M. Killey, 1975. A guide to the geology of the Middle Illinois Valley : Putnam, Marshall, and Peoria Counties, Illinois. Discover the Midewin National Tailgrass Prairie, the largest protected open space in northeastern Illinois and the first national tallgrass prairie in the United States; the Joliet Arsenal; and interesting glacial out wash (flood) deposits and tills loaded with erratics (non-native rocks). The trip guide also describes the Masonia/Braidwook State Fish and Wildlife area, known for its high-quality plant and animal fossils. Wayne T. Frankie and Robert S. Nelson.
. D. L. Reinertsen, D. J. Berggren, R. C. Anderson, and M. M. Killey, 1975.
. George M. Wilson, 1960.
. Leaders, William E. Cote, D. L. Reinertsen, G.M. Wilson, M. M. Killey, 1970.
. Wayne T. Frankie, Russell J. Jacobson, John M. Masters, and Nancy L. Rorick, Alicia K. Admiraal, Michael R. Jeffords, and Susan M. Post, Michael A. Phillips, Elizabeth Jones, 1997. Explore the scenic Palisades, majestic valley cliffs extending several miles along the Mississippi River, and the surrounding area. Look for fossils in some of the exposed limestone and shale bedrock strata in the field trip area. The guidebook will help you understand the geologic evidence showing how the last glaciation in Illinois created unique habitats, including sand dunes and thick deposits of windblown silt called loess.
. George E. Ekblaw, Robert E. Bergstrom, and William C. Smith, leaders, 1997. 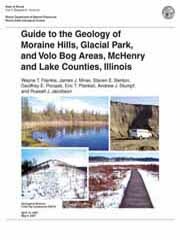 Guide to the Geology of Moraine Hills, Glacial Park, and Volo Bog Areas, McHenry and Lake Counties, Illinois. Wayne T. Frankie, James J. Miner, Steven E. Benton, Geoffrey E. Pociask, Eric T. Plankell, Andrew J. Stumpf, and Russell J. Jacobson.
. David Reinersten, Myrna Killey, Phillip Reed, Ross Brower, 1992.
. George M. Wilson, David L. Reinertsen, William Cote, 1964. Mt Carmel area, Wabash, Edwards, and White Counties, Illinois and Posey County, Indiana : Mt. Carmel, Princeton, Albion, Carmi, and New Harmony 15-minute quadrangles (COPY Print on Demand). David L. Reinertsen, Dwain J. Berggren, and Sandra McDanold, 1976.
. W. T. Frankie, R. J. Jacobson, and B. G. Huff, [John L. Masters], 1996. Print on Demand Copy, Mt Carroll area : Carroll County, Savana and Mt. Carroll quadrangles. Leaders, William E. Cote, D. L. Reinertsen, G.M. Wilson, M. M. Killey, 1970.
. D. L. Reinertsen, D. J. Berggren, and M. M. Killey, 1971.
. David L. Reinertsen, Stephen T. Whitaker, Leon R. Follmer, 1989.
. Pius George M. Wilson and I. Edgar Odom, 1959.
. George M. Wilson, I. Edgar Odom, Betty J. Hanagan, 1958.
. D. L. Reinertsen, S. T. Whitaker, P. C. Reed, and L. R. Follmer, 1990.
. George Ed Odom, George Wilson, Dean Swengel, 1962. .C. Pius Weibel, David L. Reinertsen, Philip C. Reed, 1989. The field trip covers information about part of Tazewell and Mason Counties. Pekin is located in the north-central portion of Illinois along the Illinois River about 160 miles southwest of Chicago. Stop descriptions include the terraces, meanders, and buried valleys of the Mackinaw River Valley; the Henry Allan Gleason Nature Preserve, Sand Ridge State Forest; Manito Investment Co. West Side Sand; Jake Wolf Memorial Fish Hatchery; R.A. Cullinan and Sons Inc. Lowry Pit; and the Cornick Sand and Gravel Pit. Print on Demand Copy Scenic Pere Marquette State Park is located near the confluence of the Mississippi and Illinois Rivers in southwestern Illinois. Majestic limestone bluffs create a spectacular vista along Illinois Route 100 (the Great River Road) from Pere Marquette State Park, southeastward toward Alton, Illinois.The guidebook discusses how geologic processes, including flooding by ancient seas, sediment deposition, tectonic movement, weathering, erosion, and glaciation, have all helped produce today’s landscape. Stops include Goat Cliff Trail, Pere Marquette State Park; Keller Quarry at the Grafton Visitor Center; National Great Rivers Museum; Melvin Price Lock and Dam; Piasa Park; and Kimaterials, Inc. Lohr Quarry. David L. Reinertsen, Janis D. Treworgy, 1991. 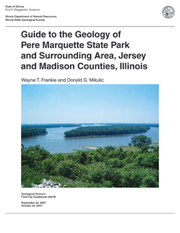 This guidebook discusses the geology, landscape, and mineral resources of part of Winnebago County in north central Illinois. Stops along the route include Lone Rock, Rock Cut State Park; a road exposure along Perryville-Hart Road; Rockford Sand and Gravel Company, North Shore Plant; Atwood Homestead Forest Preserve; Austin Quarry; Colored Sands Forest Preserve; and Rockford Sand and Gravel Company, Farm Quarry.